St John's is an Anglican Parish in the Catholic tradition on the Balmain Peninsula. It was established in 1882 and since that time has served the people in Balmain and Birchgrove and the workers on the adjacent islands, Cockatoo, Spectacle and Snapper. 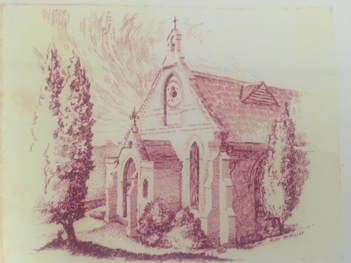 This maritime involvement gave St John's, as the youngest Anglican church on the peninsula, a special character and role in Balmain. The rectors acted as honorary chaplains to the Biloela Jail on Cockatoo Island and the to the floating reform school ships, Vernon and Sabraon moored off the island. The original building, which was licensed for use on 16th June 1882, extended to the present chancel steps and cost ₤1,200. The idea of adding classrooms to the building for a school was abandoned when state aid was withdrawn from denominational schools from the end of 1882. The St John's Hall was built in 1884 at a cost of ₤368. In 1911, Cyril Blaket submitted plans for a much more ambitious brick building complete with tower, but this was never pursued because of cost. A kitchen was added in 1934 and four years later the staircase to the lower hall was moved to the outside of the building to enlarge both the stage and the hall below which, during the 1931 Depression and since it had facilities, was used as a soup kitchen for the unemployed. In the 1960s, a further room was created under the main hall to be used as a meeting place and coffee shop for the younger folk after a service in the church. The organ at St John's dates from 1915 and was built by the Pyrmont firm Griffin and Leggo, who were in partnership between 1915 and 1918. They built a number of organs locally besides undertaking two major rebuilding jobs in Fiji. The pipes were made and voiced by Alfred Palmer and Sons of London. When the church was opened in 1882, its first organ was an American reed organ... to be replaced some years laer by a larger instrument, which had been lent rent-free by the city firm of Palings. There is a record that a small boy of six offered his services as blower without charge. In due course the church acquired a Dresser pipe organ from St. Andrew's Summer Hill, which was later enlarged by the addition of a second manual. It served the church until 1913 when a new one was ordered and the Dresser was sold to St. Augustine's in Neutral Bay. An electronic pump was added in 1923 and a new stop in 1930. 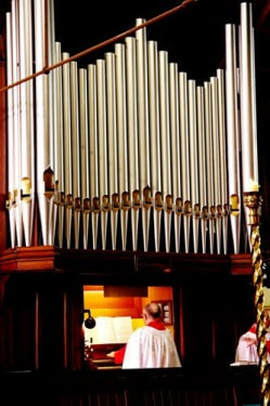 In the church's jubilee year of 1932, the whole instrument was dismantled and rebuilt in its present position because "it would better balance the appearance of the church and assist the choir". During the the work it was found that accumulated dust from the just-closed coalmine nearby had choked every part of the instrument and also that the floor beneath the organ was riddled with borers threatening stability.